The cornea is sometimes referred to as the “window of the eye.” It provides most of the focusing power when light enters your eye. The cornea is composed of five layers of tissue. The outer layer is the epithelium. This layer is made up of highly regenerative cells that allows for fast healing of superficial injuries. The two middle layers of the cornea provide strength, shape and structural stability to the eye. The two inside layers work to keep fluid out of the cornea and maintain its optical clarity. LASIK laser vision correction is performed on this part of the eye. This is the clear, gel-like substance located inside the eye’s cavity. 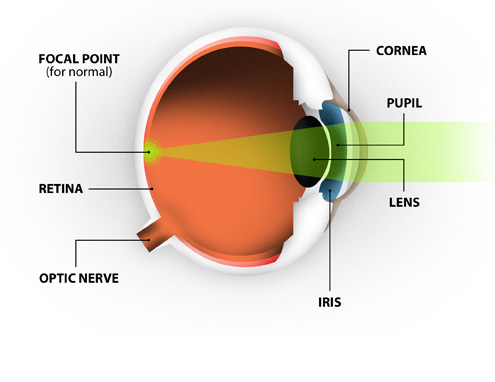 The purpose of the vitreous body is to provide a spherical shape to the eye. The vitreous may develop small clumps known as floaters. These are more common in nearsighted people than in the rest of the population.